Robert Florentino became the first male World Judo Championships medallist for the Dominican Republic. The 20-year-old is based in Valencia, Spain, in order to compete regularly throughout Europe and to develop his judo as he prepares to join the senior circuit next year. Florentino defeated Georgian, Croatian, Uzbek and French opponents and scored four waza-ari and ippon during that riveting run which added his country to the list of medal winners. The youngster lost out to Tajima Goki (JPN) in the final but was still ecstatic to see his flag raised to the rafters and to achieve a first for his country after a superb display. “I started judo when I was seven years old after trying out boxing and baseball,” said Florentino. Junior Pan American Championships winner Florentino lost out to Hungary's Toth Krisztian at the senior Worlds in August. “I enjoyed the physicality of judo when I started in my local club and it quickly became my passion. When I was 15 I started to travel with judo to compete abroad and from the first moment I loved representing the Dominican Republic. 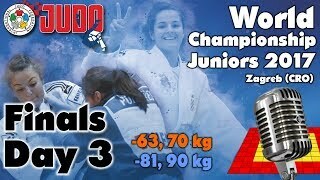 Florentino is one of a host of Spanish-speaking judoka from the Americas who have flourished by honing their craft at Valencia Judo Club, home to long-time Spanish internationals Sugoi Uriarte and Laura Gomez (ESP) who were both present in Zagreb. “I have to thank my teammates here, everyone at home and everyone in Valencia who have helped me to this medal today. I am happy to be part of the club in Valencia and I feel at home there. I now look forward to competing at senior events next year and I really want to be at the 2018 World Championships in Baku, Azerbaijan.